The Barn, Beechcroft Self-cateringCharlotte & David Underwood welcome you to their converted barn for self-catering holidays. Situated 3 miles South of Worcester in a rural location, it is just off Stonehall & Kempsey Commons with views to the Malvern Hills. It is sited on our 6 acre smallholding of which an acre is fruit trees, from which we have cider and apple juice made. We have a Jack Russell called Patch, a small flock of sheep, poultry and geese and Spin, a thoroughbred horse, There is private access & car parking for 2 cars (more available) & an enclosed garden with BBQ and garden furniture. If you wish to bring horses we have good stabling facilities and grazing plus a kennel for your dogs & a lockable shed for bikes and general storage. Over the road is Eastfield Coarse fishing lakes and there are tennis courts and play areas close by, and golf and equestrian facilities within 15 miles. It is an ideal holiday destination with local tourist attractions and immediate access to the countryside - the Malvern Hills are only 10 miles away. A good network of country roads offers cycling for the whole family. Worcester is 3 miles away; Malvern, Pershore & Upton Upon Severn under 10 miles; a little further is Cheltenham, Tewkesbury, Ledbury, Evesham & Stratford, all offering a variety of attractions for the family whatever the weather. Birmingham, The Cotswolds, Forest of Dean & Herefordshire are easy day trips too. 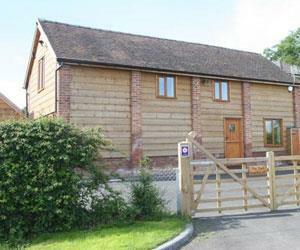 Converted in such a way as to maximise space, comfort & character, The Barn sleeps 5/6 people & baby. There is under floor heating throughout, oak flooring downstairs & carpeting upstairs with winding oak staircase, oak doors & several exposed beams. On the ground floor there is a well-equipped kitchen & table for 6 people. Facilities include electric cooker, microwave, dishwasher, fridge/freezer & washer/dryer. The sitting room is spacious with windows & French doors opening out onto the patio & garden, TV/DVD/play station & music centre. Wifi is available too. A double futon provides further bed space for extra guests. There is a downstairs toilet and basin & good-sized hallway. Upstairs is a double bedroom & en-suite (shower above bath) with views to the Malvern Hills. The single room looks northwards & the twin room (with extra under bed) has the morning sun. The main bathroom has a shower above the bath. All bedrooms have built in cupboards. There is a no smoking policy & well-behaved dogs are welcome by arrangement. Horses & dogs will be charged separately. Linen & towels, electricity & central heating are included in the price. A cot and highchair are available for hire. Babysitting can be arranged. The owners are happy to show children the livestock & give advice on local attractions. For longer term booking enquiries please contact the owner directly. Facilities for children: Cot provided, Highchair provided, Baby sitting, Toy, game and video selection., Other facilities for children, Children's video/DVDs Children welcome from any age. The Barn, Beechcroft offers weekly bookings starting on Friday. Only 3 miles from J7 M5. Take the B4084 towards Pershore. Take 1st right signposted Littleworth/Norton into Woodbury Lane. Take the 1st left into Littleworth (The Retreat pub is on your left). At the T-junction (Norton Parish Hall is on your left) turn right, signposted Pirton/Hatfield. The Barn is on your left at the next T-junction. Sat Nav sometimes takes you to Eastfield Farm which is just down the road on the opposite side. junction. The Barn is 1/4mile up the road on the left, at the next T-junction.